Our fantastic collection of duck recipes shows the true versatility of this wonderful bird. Duck à l’orange or duck with hoisin sauce are great, but to limit duck to a few well-worn dishes would be to underestimate a brilliantly diverse meat. It is widely loved for its rich, tender meat but the bird has other wonderful culinary uses too – as Josh Eggleton’s Duck fat roast potato recipe perfectly demonstrates. 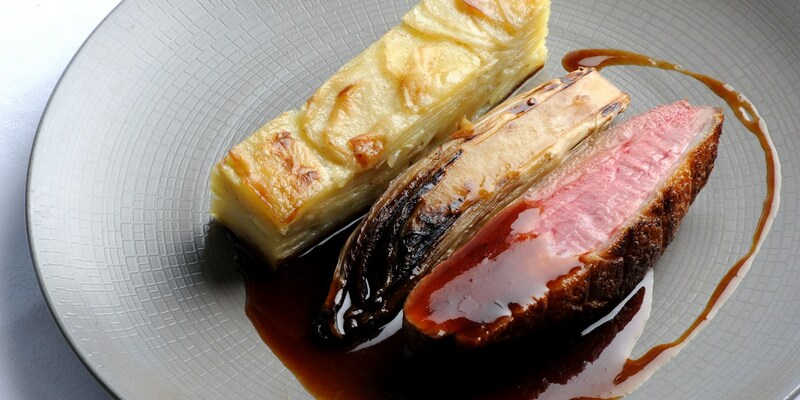 Duck has a succulence which lends itself well to sweeter flavours, but it can also work well with umami tastes like mushrooms, or even other meats – as shown by Matthew Tomkinson in his Duck breast recipe, which serves the bird with pork belly and ceps. Andy Waters pairs duck leg with braised cabbage and peppercorns in his simple Duck confit recipe, an impressive dish that is relatively easy to prepare at home. Marcello Tully’s Chinese roast duck offers a fantastic alternative to a take away, and there are plenty of other spicy duck recipes to be found in this collection with a variety of Asian influences. Peter Gordon offers his take on the traditional laksa with his Duck soup recipe, while Matthew Tomkinson's Massaman curry recipe pairs duck meat with Thai spices in a comforting, warming meal.